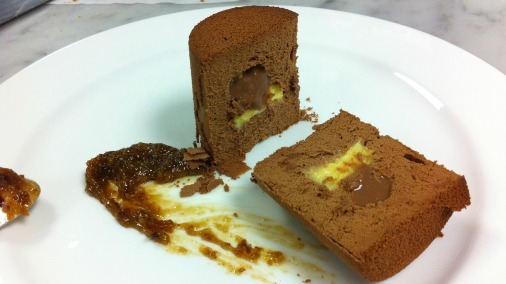 A chocolate dessert pilgrimage with Andrew Blas at Hotel Cafe Royal. There isn’t really a downside to being invited into a top pastry kitchen and being fed chocolate dessert. But when that kitchen is that of Hotel Café Royal, the gloriously renovated centre of indulgence on London’s Regent Street, and when the chef is the warm and ebullient Andrew Blas, there are many upsides. Firstly, everything about this place feels like a treat. Of course not everyone gets to while away time in the louche decadence of the private members club bar or its opulent dining room. And a full blow up courtesy of head chef Andrew Turner in one of the hotel’s fine dining spaces is possibly only for special occasions. But the café that looks onto Regent Street itself, with access direct from street, allows a quick pop in for a cup of tea and a slice of cake anytime. This café, while glamorous with golden Sienna marble and evocative of the grand cafes of Europe at its café-frequenting peak, is also a happy and informal hub. The hot chocolate may all be made from Valrhona and merit it’s own menu of tempting options, the delectable cakes may all be made by the award winning Andrew and his team, but they can all be had for a few pounds, and the fantasy of a night of wonder in the hotel beyond can feel a little bit closer. Andy in the glamourous cafe, presenting his new chocolate. 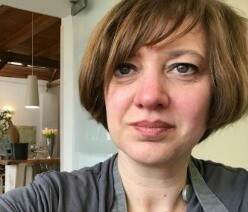 It was in this café that the launch, in late October of Andrew’s bespoke chocolate Profile 66 took place. This chocolate is the first of its type in the UK, and was developed by Andrew with taste experts from Valrhona, to meet his needs in the Hotel Café Royal pastry kitchen. Finding in Andy a passionate and creative chef, very interested in chocolate, both technically and from a flavour point of view, I hoped to find out more. An invitation followed, a shared love of chocolate is a remarkably bonding thing. 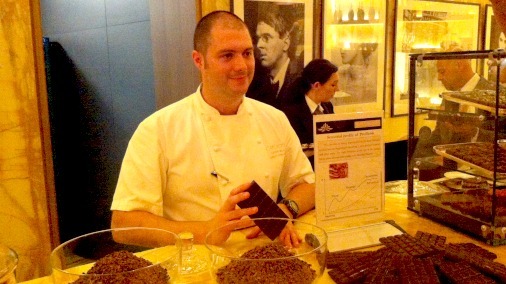 The Valrhona/Andy Blas collaboration, Profile 66. 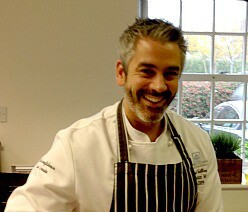 Andy is in charge of a team of 22, creating all the baked goods, patisserie and desserts for the hotel, from room service, to afternoon tea, from fine dining, to grand functions. So, a single Christmas pudding for a luxury hamper here, three thousand petits fours for a wedding party there. Just as well then that Andy is a man full of energy, ambition and ideas, who fosters in the chefs under him a happy sense of involvement. When I was there many were pulled in to taste what we were considering, and they were busy comparing it to the previous weeks efforts. Spoons at the ready, Andy and some of his team get tasting. 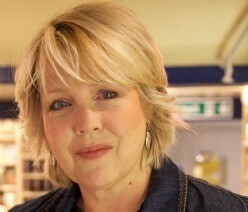 At the time that I met Andy I was researching a feature for FOUR – The World’s Best Food Magazine, on chefs using chocolate with innovation and understanding of its potential. Profile 66, Andy’s own creation, was new to him and all its potential lay ahead. Tasting it myself I felt that while it had an easy versatility, part of its remit for such a hard working pastry kitchen, it also had some marked flavour notes that suggested certain things. Over coffee under the spooky gaze of the café’s Halloween window display we tasted and talked, and decided that Andy would create a dish focusing on our shared musings on his tasty new ingredient. It was the week before Christmas when I returned to taste the result. 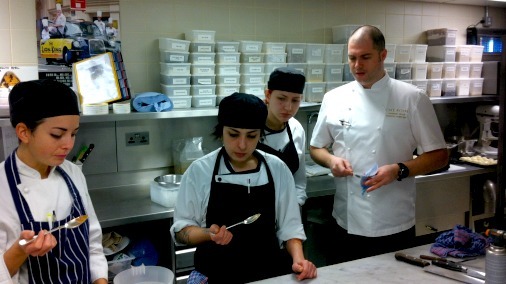 Andy had also been stupidly busy preparing for the imminent world finals of the Coupe du Monde de la Patisserie, which were to be held in Lyon at the end of January. Andy, along with team captain Barry Johnson of Rococo, Javier Mercado of Le Cordon Bleu, and team coach Martin Chiffers, would be heading out to whip, pull, temper and carve our way through in an attempt to bring glory on the UK. And they did truly achieve that, our team, one of only 21 in the world to compete in the final, was placed sixth. This ensures them instant qualification to the next world finals in 2017. We should be very proud indeed. On arrival at the hotel I went down into the gleaming depths, to the large kitchen dedicated to pastry that runs alongside the main kitchens. 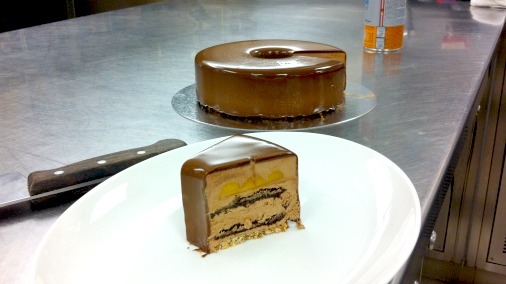 On the pass sat a glossy ring-shaped entremet, precise, tall, and innocently calling me with its ombré glaze. Andy would have been hard put to miss the focus of my attention, there was chocolate dessert in the vicinity, and it looked a doozy! This beauty turned out to be a practice run for the chocolate entremet needed for the coupe finals. It just so happened that the first task for the day was to see how it had turned out; it was our job to taste it! Well it was Andy’s job, but I was along for the ride and you didn’t hear me complaining. In the event it was still too cold, so we had to taste it twice, shame that, we tasted it straight away, and again later, after it had warmed closer to ideal temperature for serving. 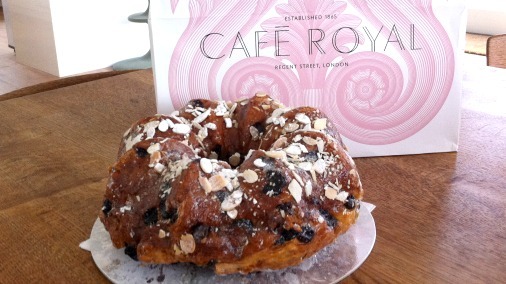 A fantastically good Hotel Cafe Royal stollen. So, world-class dessert for elevenses, how was it? A base of crunchy almond streusel, with a touch of flavour boosting salt, was topped by flourless chocolate sponge, then zingy passion fruit cremeux, then more of the deep cocoa rich sponge, then a mango jelly, rounded out with vanilla, the whole encased in a good layer of light, creamy Manjari 64% mousse, and that beautiful smooth dark chocolate glaze the finishing touch. While Andy picked up on any miniscule error, any room for improvement, any uncertainty, I just sort of stood there and smiled. I might have swooned, but professionalism kicked in and the ‘errors’ in question discussed. Yes the vanilla wasn’t a clear flavour note, but I personally found it very effective in making the mango good and deep in flavour, I didn’t want it too assertive and thought it bang on. The passion fruit was a little muted, but this was found to be absolutely right itself on our second tasting, a couple of hours later, when the temperature of the cake was correct. By that time, minor layering corrections of millimetres aside, even Andy was smiling, admitting that it wasn’t bad. Funny how a nice chocolate cake will do that to a man! 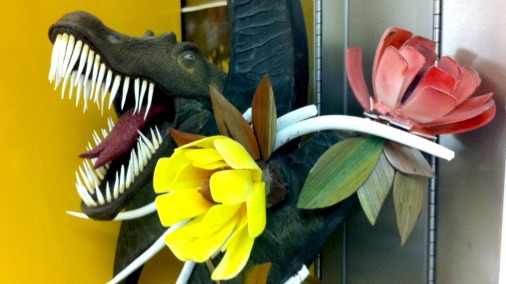 Chocolate beasts lie in wait in the chocolate room. In the intervening couple of hours Andy and I withdrew to his chocolate room. This was not unlike the traditional man-cave; shed sized, filled with tools and other bits of kit, only this one had a tempering machine pouring molten Profile 66, drawers full of wonderful pastry gear, and a delightfully festive gingerbread village at one end. 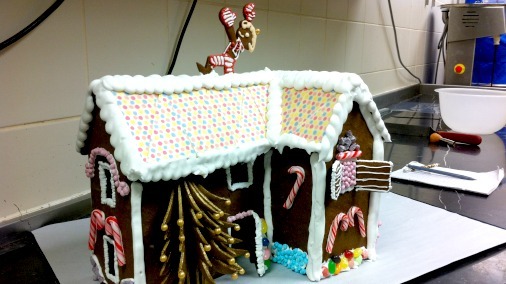 Part of the gingerbread village. Out came acetate, red and gold metallic dust, half-pipe moulds, and as Andy poured, smoothed and teased chocolate he told me his ideas about our chocolate dessert. Profile 66 is a happy dark chocolate, easy to like, smooth in melt and flavour. It is dark, but without bitterness, it has fruit, the bright honeyed tastes of yellow plum or apricot, and it has nuts and spice, redolent of gingerbread or gently toasted teacake. 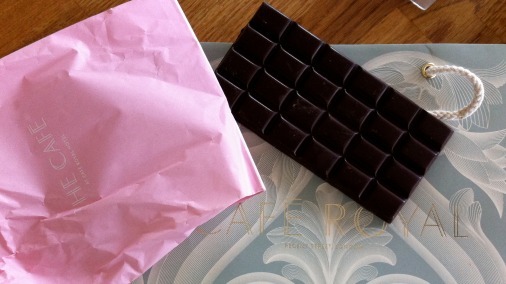 For me this chocolate lends itself to many things, but bringing out these notes, perfect for winter, was a no-brainer. Chocolate mousse, liquid chocolate, kalamansi lime mousse, spiced dried fruit. 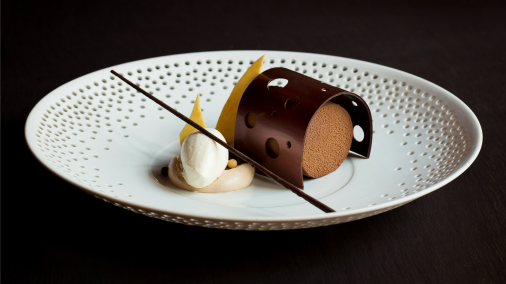 First on the plate came a mousse, a clean cylinder of creamy perfection using both Profile 66 and Manjari 64%, in a fine shell of lightly crisp chocolate. This central element is delicate, with the gingerbread notes of the chocolate to the fore, and hints of fruit. At the core of the mousse are two complimentary and wholly different elements, a chocolate liquid, which adds cool creamy texture, and a kalamansi mousse, which ramps up the fruit factor and intensifies all the flavours, a clever lovely high point of the dish. Alongside the mousse is a cream of dried fruit and stollen spice, the twang of fruit and warm spices picking up the flavours natural to the chocolate and highlighted by the kalamansi lime. Tempering the acidity of this is an aerated ganache of Valrhona’s Caramelia, which eaten with the rest brings roasted chestnuts to mind, a tasty bit of flavour alchemy. A milk sorbet has the nostalgic hit of a mini-milk lolly, and freshens the palate without quitting the comfort theme. Crisp compressed stollen, rich with dried fruit and the winter wonderland tastes of yeasted enriched celebration bread, adds depth and a lovely bit of baking to the mix. Completing the whole a curve of fine tempered chocolate, arching across the plate, brings home the point of the dessert, a celebration of Profile 66, the chocolate at the heart of it. You can eat a little of it in its pure form, or dip into the varied riffs on its flavours that the dessert represents. Believe me, I did, and couldn’t help but love it. The finished dessert. Profile 66 showcased to perfection! Thanks Andy, heaven on a plate.